So I found the post with Tesla's old 'loudness' chart. Honestly, I like where I was going with the idea, but I think I'm just going to cut out the whole idea and just say how loud she is to everyone else, leaving out how loud she is to herself. It's really the only part about it that matters to everyone else, since I know how loud she is to her own ears. E.A. is going to make Joey and Jake very much jaded towards predators at this rate, where there's the "imitation dingo," the actual dingo, and now the "micro dingo," alongside all the other predators. Unrelated to that, but related to the roleplay even still, curiosity hit again and I decided to see how big a degu and capuchin monkey are, for sake of size reference. In the real world, the degu has an average measurement of ten inches, and the white-headed capuchin monkey 15.5 inches. These are all excluding tail. This has me thinking. Should we add real world averages per species in measurement to the first post for the sake of having a sense of who's going to be bigger on species alone? With the fact that we're going to be having both predator and prey species around—and that they're likely not domesticated creatures—having that kind of list around might actually be helpful. yeah, double posts are fine after a day or two. that actually would probably be a good idea. I'll see about adding a size ranking/list to the first post. So are we going to wrap this water mess up soon? I'm sorry if I missed an announcement somewhere, but I feel we're stagnating from some lack of attention. I apologize for my lack of contribution on this end, but there's not much I can get Tesla to do with it not being strictly against her defined character. On a slightly related note, I've had another character design in mind. Two, really, but I know which one I'd rather go for since I think the personality is more interesting, personally. Hopefully they will be able to keep me from not being able to push a scene again. Given the nature of Exotic Acres, I'll be leaving the character sheet here in this thread. Appearance: Spending most your time either in flight or resting upside down makes wearing a collar difficult. Instead, Valor has his black hairs dyed in different, brighter colors in order to distinguish him from wild bats. He's rather large for his kind, wingspan reaching a grand five feet and five inches; in the upper ranges of his species. Usually, his hairs will be dyed a silver color, but one can see him with blue, green, or white colors. Personality: Valor is a loyal, even to a fault, though this does not come without first earning it. Coming from the wild, Valor is familiar with poaching, and what negative reactions humans can have with fear. This has left him mistrusting of many things one can find in human settlements, save for the trees and vegetation one might find there. This mistrust can come across as a bit overly defensive—and even as dismissive—but even behind all that, Valor is warmhearted. Never been a creature in need that he hasn't helped... not for lack of trying, anyway. Yes, he has been tested and treated. He's clean of disease and parasites. He does have a locator chip. - Strength: 4 - "Do not try to fly and carry food at the same time." - Perception:6 - "What makes you think I'm blind?" - Endurance: 8 - "Do you know how exhausting flying is?" - Charisma: 7 - "I know the sound of someone who's upset. Why don't you talk to someone? Vent a bit?" - Intelligence: 7 - "Philosophy is one of the few interesting things that humans have. The other the amount of culture wasted on frivolous things like fame and fortune. They're interesting together because one promotes ignoring the other, but it's made a goal anyway." - Agility: 7 - "I used to fly around tree limbs daily." - Luck: 3 - "I'll simplify and say I'd be dead if the skin of my wings didn't regrow." Yay for 03:30 (3:30 A.M.) posts. And no, bat wings really do patch themselves up naturally. yeah suddenly we sorta stopped for a moment there, I don't know what happened either. Maybe we can just5 say that everyone helped out and it got taken care of ? yeah, I think we can probably skip the rest of the cleanup, the slow down is mostly my fault, I fell behind on a lot of RPs this month and this is one of the ones I didn't catch up on. I'll try to move things along in my next post, hopefully tonight. as for your new character, Leaf, I think it's illegal to keep a bat as a pet in the US. or at least not advisable. except with a rehabilitator's license, to make them suitable for release into the wild. I suppose if he's deemed not suitable for release in some way, the rehabilitator could keep him. We're going with that? I kinda figured being a fantasy setting with the premise of exotic animals that are either not allowed or hard to care for in other towns, this would be the exact kind of pet that would be welcomed with open arms. Suppose if you're sticking to that I can go for the other character idea. well, we do kind of have some leeway, since we don't know exactly how laws like that work in the HP universe. I guess lions and kangaroos may fall under the same "not advisable" category. fine, I'll accept him. I'll still keep endangered pets out of the rp though. okay, hopefully we can get this rolling again. Wait, both of my characters are endangered... Also, I haven't done anything... Period. Um, how can I do dat. Wait, both of my characters are endangered. as for doing things, we're on our way to the mini-golf course if you want your characters to meet us there. Hybrids still aren't allowed though, right, Brent? And in your defense, Brent, pangolins have been kept as pets, even being endangered. alright... I think I was at one point waiting on Mickey to post, but apparently she did over a month ago and I didn't notice so... my bad on this going inactive? 22xander if you're still in here, feel free to meet up with us at the mini-golf course. or just be there, I'll have one of my characters pull you into our group. The poking will be so real, you might forget there was ever such thing as not being poked. 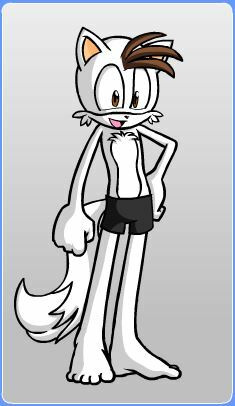 Appearance: He has shaggy white fur all over his body, except how a tuft of brown hair. He has brown eyes, is 3 ft. and 5 in., and has an average body in weight. He also wears a blue collar. Personality: Sam is a quirky, smart fellow with a great sense of humor. He likes playing video games, and he would rather play them than do something boring. He often gets very curious about other people's business. He is calm most of the time, but gets aggravated when things don't go his way. He also spaces out sometimes. Welcome to the forums, by the way! Please do feel free to poke a mod at any time if you have any questions about anything or if there's anything we can do to make you feel more at home here! Personality: Sam is a quirky, honest, smart fellow with a great sense of humor. He likes playing video games, and he would rather play them than do something boring. He often gets very curious about other people's business. He is calm most of the time, but gets aggravated when things don't go his way. He also spaces out sometimes. Other Notes: As a pup, he lived with his mother and siblings in the Arctic. He was the youngest of his 3 brothers and 1 sister, but they all lived happily together. Unfortunately, all good things must come to an end, for one day, they were attacked by a gang of polar bears. Sam's mother fought for her life in defending her pups, but the bears managed to maul all of them, except for one. As she struggled to keep her life, she cried, "Sam, you are my last pride and joy, and I can't afford to lose you. You may be just a pup, but you have a long road ahead of you. It may become perilous or devastating at times, but trust me, your life is going to be wonderful. Now run! Run away as fast and far as you can!" As he did, he looked back at her mother as she kept fighting the bears. Later, a hooded man in a puffy jacket found Sam balled up in the snow, crying. Feeling sorry for the little pup, he walked up to him and asked, "What's the matter, son?" "Huh?" Sam responded as he looked up, "Oh. *sniff* Just loneliness, sir." "I see," the man said as he knelt down towards the young fox, "And why's that?" Sam then proceeded to tell his story. Eventually, he explained to the man, "I managed to escape the bears, but all my siblings were killed." "Oh," the man sighed, "And what became of your mother?" "I don't know," Sam answered, "but she probably died as well." "Hmmm..." the man dismally puzzled; then he perked back up and said, "Hey, how would you like to live with me?" A nervous look came across Sam's face. "Y-You're not going to do any thing to me, are you?" he mumbled. "Of course not," the man replied. He then took his hood off to reveal a face of kindness with somewhat side-swept brown hair. "Cross my heart and hope to die." Sam face went from displaying nervousness to slight relief. "You can call me Mr. Vayner," the man said as he stuck his hand out toward the white fox. Sam hesitated at first but then reached out to shake Vayner's hand, saying, "I'm Sam. Nice to meet you Mr. Vayner." Vayner then helped him up and led him to his Arctic abode, where he lived there for a few years. Eventually, they moved to Vayner's true home in Exotic Acres, where they still live today. Actually, I've been here for a while as NeoWolf. Ah. That's what I get for not checking your IP. Would you like your accounts merged under the new name? Sam is approved! Welcome to the RP! Also, I would appreciate it if you would speed up the RP. Please? to answer about starting, currently all of the active characters are at a minigolf course, so you could meet us there. as for speeding up the RP, I suppose we could be a bit more proactive in poking the players so that posts don't end up a month apart. I'll see what I can do, but keep in mind it could still end up with a couple days between post, or more if the players state they're busy for a short period. Serence has been flat out and exhausted with work lately. I'll give her a poke though and I'm sure she'll do it as soon as she can. This weekend at the latest. Thanks, but I was thinking maybe the players could post multiple times per day, just to keep things fun for the not-so-busy-players. While ideally, it would be best to post multiple times a day, RP takes a lot of time to think about and write responses. It sometimes takes me a half hour to think of something to write for just one character, and some people have over a dozen total. In addition, most people have jobs and outside lives and often don't have time to post. It's best to just be a bit patient. Sometimes things move fast, sometimes they don't. Serence, when will you post in the RP? I want to introduce my character into the world of Exotic Acres! sorr my bad , done ! in addition, there are time zone discrepencies. often I'm asleep when roo or serence post, or they are when I do because they're on the other side of the world. Yeah. I'm in Australia, Serence is in Vietnam, Brent and many others are in America, Valerio is Italian, and Welshie is in Wales. So we have people all around the globe. So patience is a virtue on the forums, my friend. ^^ That said, EA is quite slow at the moment and we definitely would like to get it going faster. Perhaps you could play some of the forum games while you wait for people to post? Or try out a second RP? Me too! Join the club! Excuse me, but why haven't you added my character to the active characters list? The character lists aren't updated very frequently. I've been here for half a year, and none of the character lists include me. I also noticed many character lists include players that I don't see around and who don't seem to post anymore listed under active characters. Yeah, updating character lists are lower priority than keeping the RPs running and keeping the RPs running is a lower priority than life in general. So GMs don't always have time for that. We do our best though. Rest assured that you are an official and valued part of the RP even if your name isn't on that front page! It's definitely not a personal snub against you or anything. I can promise that.